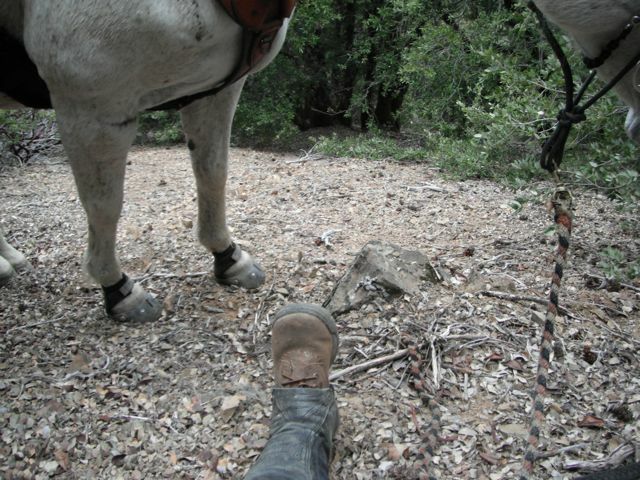 So, you think boots are nothing for a real trail rider or packer? 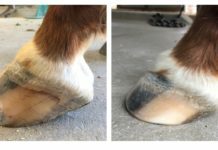 You think your kind of riding is impossible in anything but steel shoes? Think again! Clyde Ready to go in his boots. 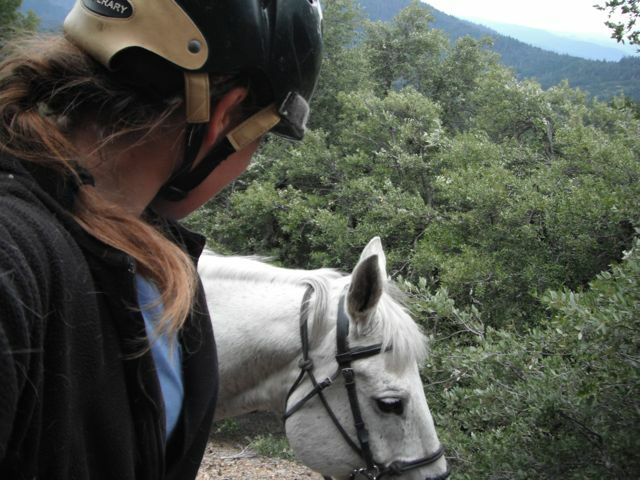 Out here in the Wild Wild West of the Northern California mountains (shaped by tectonic and volcanic forces, and the addition of coastal weather erosion, these are “Man from Snowy River” style mountains), we do more than trail riding…we do EMT…Extreme Mountain Trails. If you make mistakes out here, you will likely need an EMT of another sort. 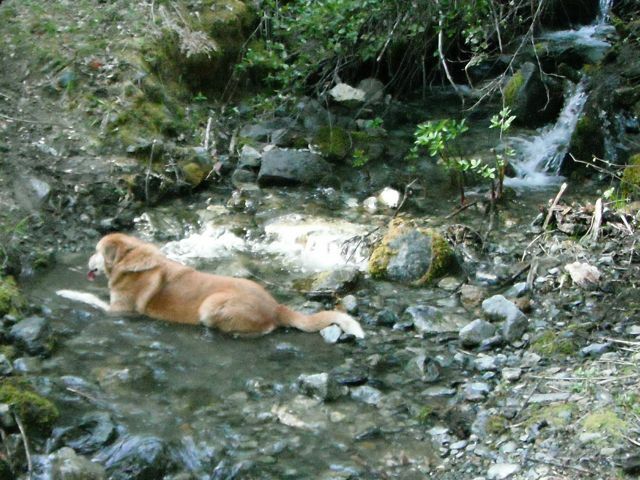 The dogs even get tuckered out in this terrain… drink and cool off at the same time, smart pup! 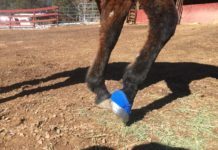 This means your horse and yourself better be in good shape, and be well trained, and your equipment better work right and hold up. 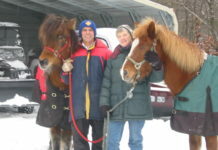 There is no room for error out here, and the only way our for humans is maybe life-flight (nearest hospital is almost 3 hours by car, same for the nearest vet), and horses…well, let’s just say there’s no vet that will get to you in time, if you make a mistake. Here I tried to capture the view of the mountains in the distance. Not easy while standing on a slope I was sliding off of with every step. 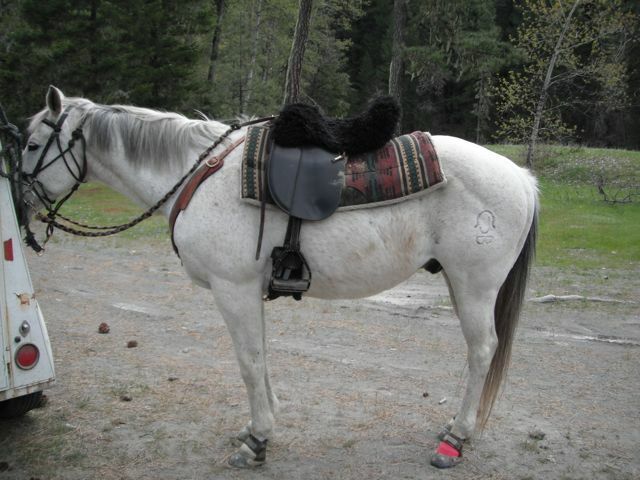 I get to come to this wonderful part of the world at least once a month, since I just started doing ’rounds’ up here (in the vicinity of Ruth Lake, off Hwy 36, to give you a general idea on Google Earth) to trim horses. To make it worth my drive, I stay a weekend and get to ride with my friend (and ‘home base’ out here while trimming and riding, and my mountain trail guide) Willi, who has explored many hidden areas of these mountains. After a day of work, we then get to go play 🙂 And it is a mighty big playground! 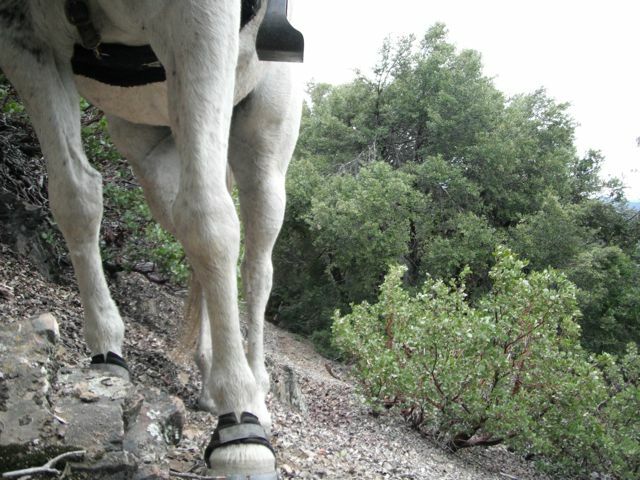 One of the days we went on a fairly easy, single track trail named “Hell Gate”. Hmmm…I thought it was lovely, and can’t figure why it got that name. It mostly follows a river (the Eel I think?) 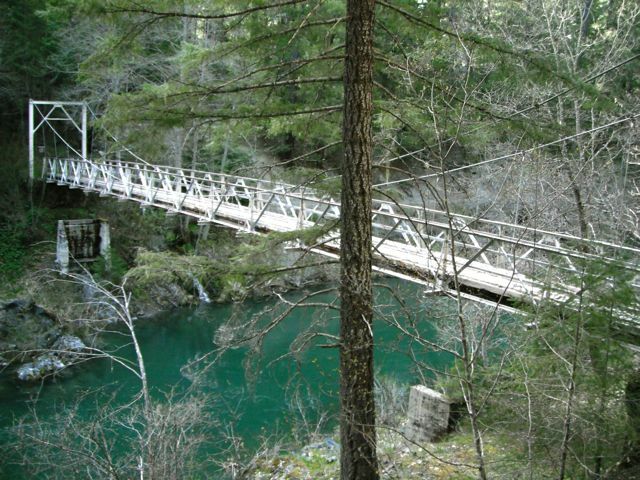 and you cross lots of creeks that flow into the river (with slippery rock bottoms, beautiful little waterfalls, and neat foot bridges) and meanders through both open timber stands and tighter oak/scrub brush areas. 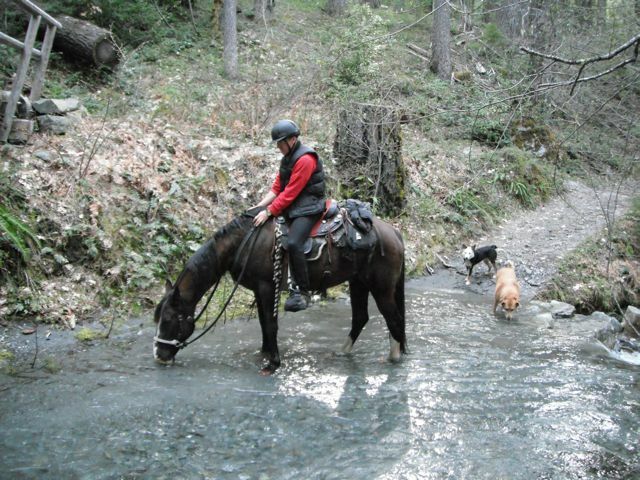 Willi and Little in another creek..so clear you can see her boots 🙂 But cooolllld water! This was the coolest bridge we had to cross over! The horses marched on over with no issues. We had lunch on the river bank, near the site of an old stone bridge. 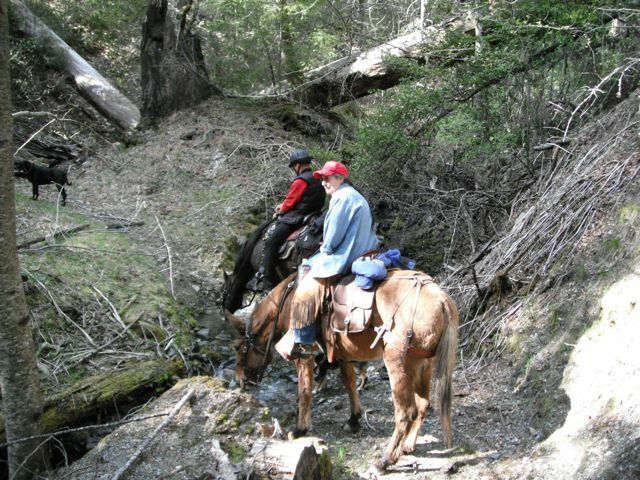 The trail was an old supply and mail trail that had serviced the area during the gold mining age and part of the lumber boom days. 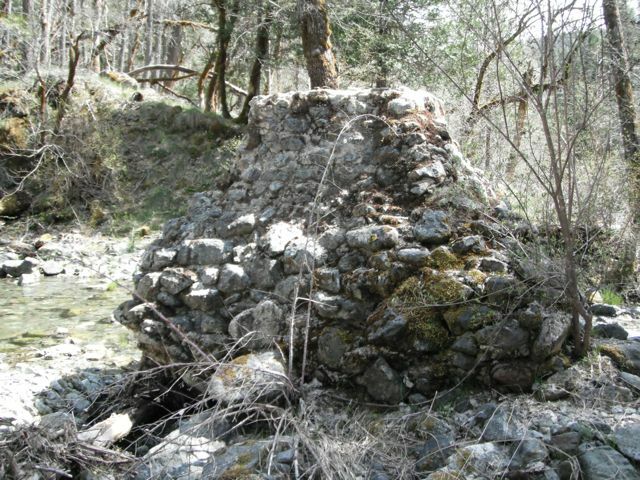 Nothing remained of the old home sites and the many ppl that must have been spread out in this river canyon, but the few scattered stones of home foundations, or clearings that had held buildings. Once in a while we saw an old orchard or even some wooden shacks of a little newer ranching history. 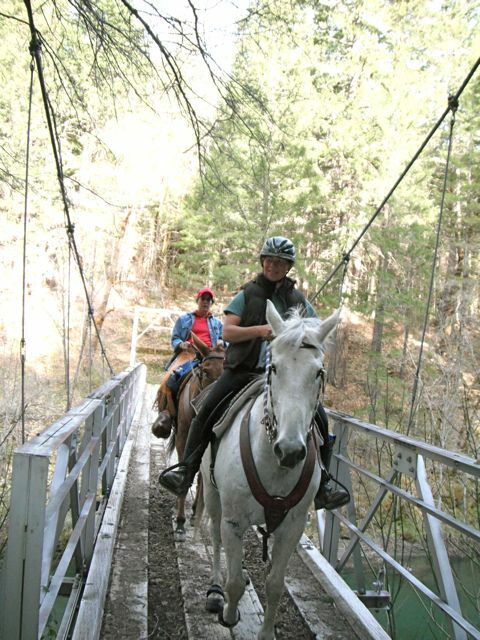 This was a fun and historic trail ride. Then on another trip up, Willi decided to take me exploring. 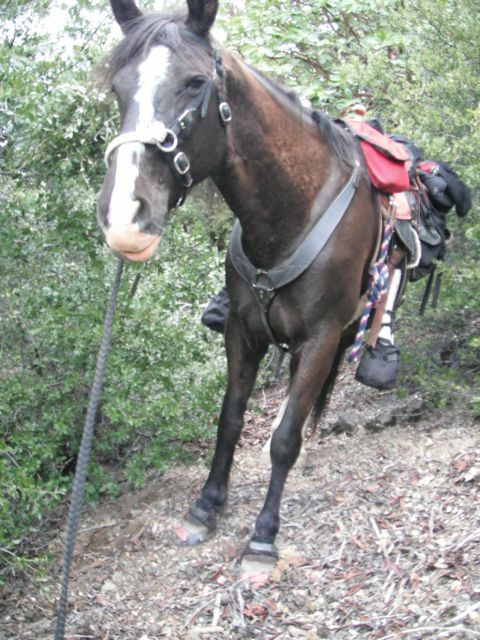 He said that we were going to go looking for some trails and roads we might be able to use for a future endurance ride we fantasized about holding in the area. 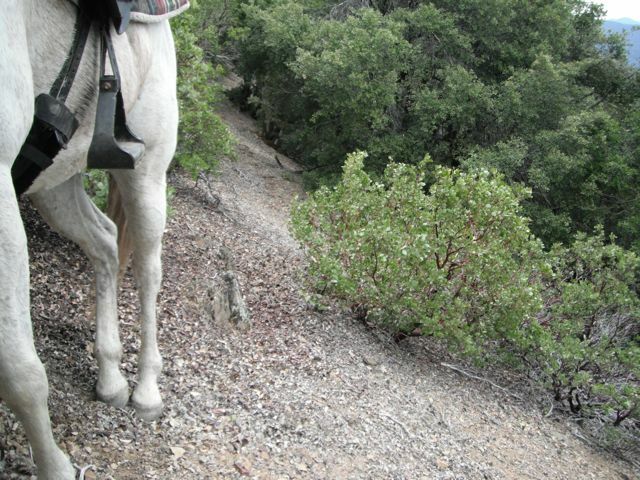 While we were out there, he talked about how all the old timers said there was an old Native hunting trail in that area, that connected the valley we were riding out of, to the next few over. 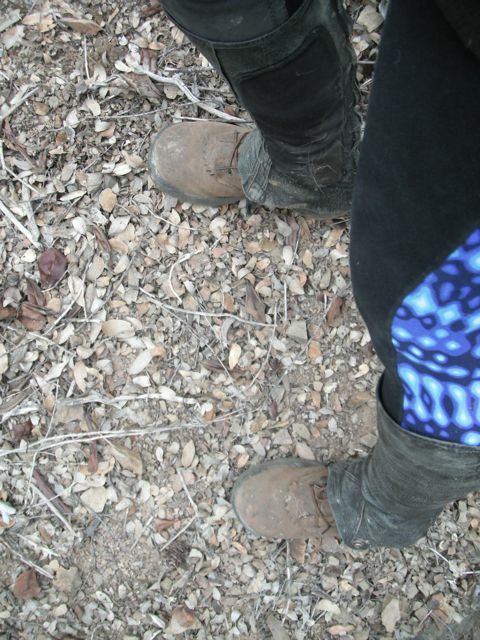 But no one had a real answer for where it was, except off one of the forest service roads we were riding that day. The newer maps only had the roads and newer trails on them, and it was hard getting your hands on old maps of the area that still had the old trails. Well, we only had three branches of roads to explore that were public access, and all three ended in dead end turnarounds. 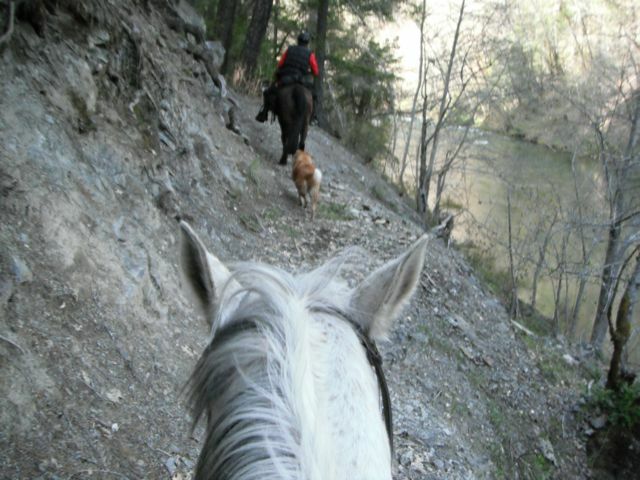 But the last one we tried, had what looked like an ATV trail that was not oft used going up the ridge off of it. We hit the dead end and on the way back, decided to follow the ATV trail, as Willi said crossing the ridge would be heading in the right direction towards the valley we were wanting to connect to. The atv track wound it’s way in the timber, up the side of the ridge, first gradually, then steep and straight up towards the spine. It became less and less distinct as it wound its way up, and finally became a single track trail as it crested over the other side. Here, it slithered its way out into more of an open hillside, clinging onto the shale and dirt in the vain hope of still pulling off the image of being anything but a faint goat track on the side of a big mountain. 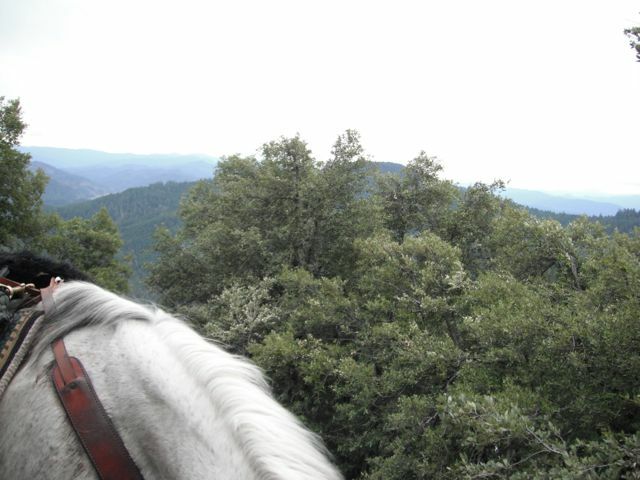 I was riding behind Willi, and had no clue where we were going, or what he was actually still following, and seriously questioning my sanity (whilst thouroughly enjoying the adrenaline rush of clinging to the side of a mountain, on a great horse, like an overgrown goat). 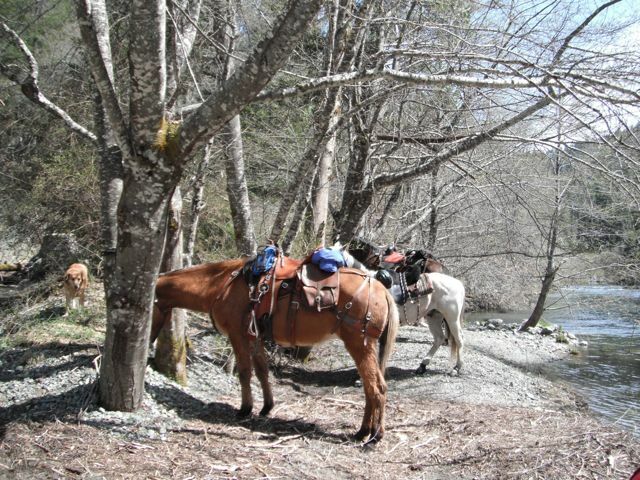 Now we emerged into EMT country 🙂 And it sure is fun riding rough country like this…provided you are on a sure footed and level headed mount. And have the tack to do it in! 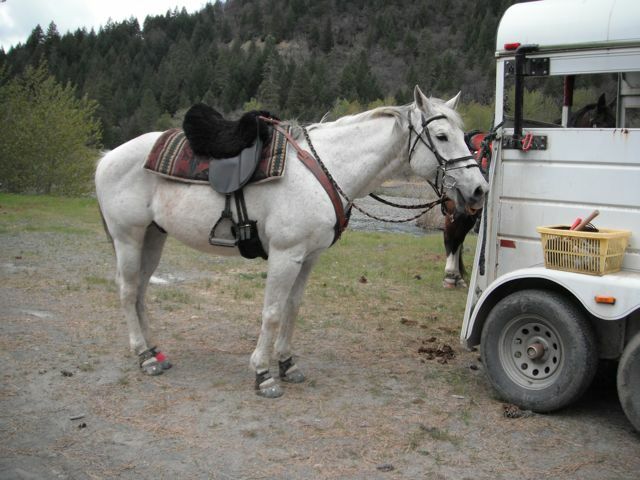 This is a 15.2hd horse… I am standing right next to him…I am 5’4″… he is not putting his head down either… LOL…. 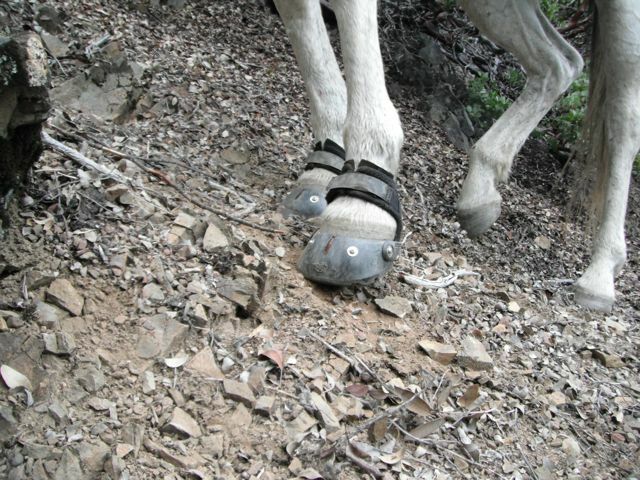 Clyde was clawed into the slope like a goat… and even then, his boots were not finding enough trail to hold onto. Luckily they hold onto that little bit of trail really well!